Coffee perspectives change from region to region. What is popular or “good” in one area will not necessarily rival or compare to that of another. As with most things in life, it’s matter of perspective. 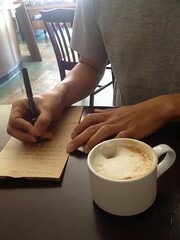 Groundwork has been suggested to me by a few LA friends, baristas and enthusiasts alike. Local chains are always a toss up and LA is still a blossoming market. I think the standard of quality still has a little ways to go, on average. More than one LA local has told me they “know soo much about coffee” or “know the best place in town,” and I sincerely appreciate the advice. I do my best to follow up on word of mouth suggestions. Snobriety comes forth: coffee is not about image or trends for me. I am a dork who has fulfilled several coffee roles over the last few years, roasts his own beans, reads books on espresso and techniques, and runs this website. I am there almost entirely because of taste and quality, other things are secondary. More than one of these suggestions has been sub par on quality but “trendy.” What friends and acquaintances in LA seem to consider “the best” coffee has left me a bit disappointed. LA coffee has been on opposite ends of the spectrum: it has either been outstanding or crap. My friend who took the photos for this article told me some of her friends brag about how much they love coffee, it is “like their life.” She reassures them, “no, James loves coffee.” Word, funny how that works, LA. Groundwork falls into the lower range of the spectrum; it is passe, average, and slightly hyped. 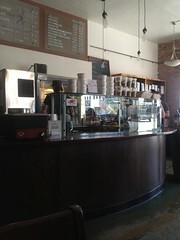 The shop itself is modeled with artsy “coffee shop” decor, lots of brick, low lighting, and artwork on the walls. It is a little drab though I wouldn’t say it’s unpleasant, just a little dark. The bar is decked with some pretty pricey pieces: a La Marzocco FB, a Swift, and various pour-over equipment. The menu stuck out at me for several reasons. First, the sizes. To be fair, I have worked in two shops that offered multiple sizes for cappuccinos. Give the customers what they want, nothing wrong with that. I wholeheartedly subscribe to the “6oz of milk with a little foam+espresso” cap, but I am not against giving people options. As I read into the menu further, I noticed there were tons of additions for most drinks. Vanilla, carm, and chocolate were prevalent menu options along with about half a dozen other flavors. Again, not a judgement on quality. Then, I looked at the prices. $3.25 for an 8oz standard cap. That is a little on the high-end, even compared to “expensive” artisan shops. Seemed like a conundrum; second wave offerings at third wave prices. These signs started to make me less than confident about the quality. Although this shop has a substantial dollar value invested in it, buying the best equipment does not guarantee quality results. These machines requires a skilled manipulator and a regimented training program to ensure that everyone can use everything to its fullest potential. There were a number of quirky things I noticed behind the bar. They weren’t necessarily bad habits, but one really stuck with me for the rest of the day. Groundwork uses a LM FB and a Swift grinder (note: I have issues with the Swift, please refer to the ‘Crema’ article if you are interested in a thorough explanation). With this kind of machinery, the baristas should be more than capable of putting out outstanding drinks. But something got overlooked in an arguably more essential and easily more simplistic process. I watched the barista make a pour-over and I was a little dumbstruck. 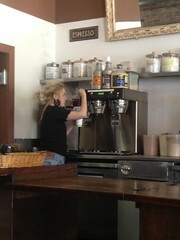 Instead of using the brewbar, she put the Melita right over the to-go cup. Not a big deal. But instead of using a kettle or even a pot to pour the water over the grinds, she used the water dispenser on the Bunn machine. Gushing hot water spilled all over the coffee haphazardly (i.e. she wasn’t really paying much attention). That is like using a hose to wash off a small stain on a shoe; not exactly the most precise method. It seemed careless to say the least. For a shop that has so much other good equipment, why isn’t there some sort of kettle? Maybe it was missing. Just seemed a bit odd to neglect such an essential (and relatively cheap) piece of equipment. How can she maintain consistency? Technique seemed almost non-existent. My cap was pretty poor quality. It was extremely foamy, steaming like crazy from the get-go, and way too hot to drink. Just by looking at it, one can see it was done rather carelessly. 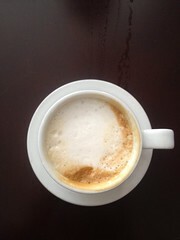 The foam was bland, over foamed, scorched and the espresso was burned and over-extracted. Watching the barista not watching the machine, I could see why my cap had gone awry; she was not paying attention to her work. In all fairness, I was actually more mad at seeing their LM go to waste because of careless/poor technique… and the fact that my cap did not exceed the quality of ones from a $30 home machine. My photographer had an iced coffee. Groundwork markets their ice coffee as a “cold-brew” and even sells it in fancy soda bottles, pretty rad idea. I hope these are not the same as the one we were served. Her’s did not have any typical cold brew characteristics. It kind of tasted like hot coffee that had been poured over ice. I didn’t finish my cap, I was pretty bummed. Had my barista been cordial, friendly and thoughtful I would not be so critical. But, from my perspective, she seemed to take little joy from her work, and this lack of care came through in her technique. She was sloppy: she left the espresso dripping and pulling unevenly, did not compensate with adjusting the grind, put an enormous amount of air into the milk at very high temperatures (you can hear it), and neglected her running, unbridled over-extracting shots. To sum it up simply, she just wasn’t watching what she was doing. These machines are supposed be “fool proof.” But there seemed to be a cascading effect; she had “no heart” for coffee, just going through the motions, and thus quality suffered. I want to make something very clear (the same goes for almost all my reviews): I am calling out one barista, not this company. The rest of the staff was relatively polite. I understand that a single experience is not encompassing and the actions of one cannot speak for all. However, it is also arguable that being candid (like I am) and evaluating shops unannounced as a patron has enormous objective advantages. Furthermore, the training techniques, goals of the company, and quality control is reflected through the staff. Thus my barista does represent Groundwork in some capacity. Thank you for your post. I too hesitate to put out less than favorable reviews but I am glad to read this one. Good points that it is not necessarily the company but it is certainly the barista and that reflects the company. I think any good coffee shop could recognize it’s about the little details that make the experience (whether it’s cleaning details or customer service details). Thank you for your thoughtful blog posts! P.S. I lived in Pasadena in 2006-2008 and while it has changed a lot in four years, I (hesitantly) suggest that you try Jones Coffee. While I think it probably falls into the “Groundworks type of coffee shop” category, it may surprise you. Certainly Intelligentsia is better for the neighborhood (which was not there while we lived there but I do so love the shop!). Happy blogging! Thank you for reading and thank you for the suggestion! Really appreciate the recommendation and I will definitely check it out. Word of mouth is how I generally find my coffee spots!